With over 50 designs to choose from, these personalized wedding glasses are the perfect choice for just about any theme or color scheme. Great for beer, soft drinks or mixed drinks, each 16 oz glass stands 6" tall with a 3.5" diameter that tapers to the base. 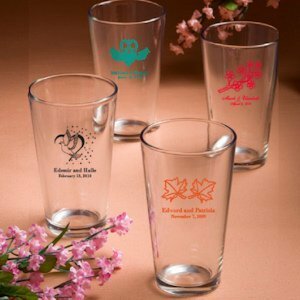 These high quality drink/pint glasses are manufactured in the USA. You can choose the imprint color and design at checkout and specify the personalization text too. 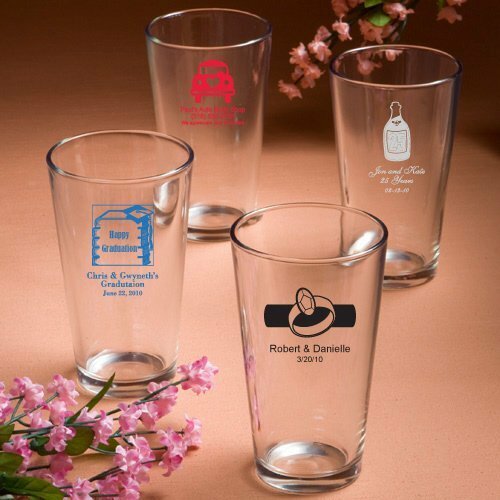 Give them to guests as pint glass wedding favors and they'll think of you every time they tip back a beer or have a soft drink - they make great keepsakes! do you have to pay the art fee if ordering the same design on a pint glass and stemless glass? You will have to pay an artwork set up charge per item ordered so if it's 2 different items even if they have the same design, you will still pay for it. Also, we have different brands so the fee will vary per brand/item.